What do we do? – more than you might think! Earlier this month members of the English Cataloguing Department attended the annual libraries@cambridge conference. This year the theme was Are you a library superhero? and we were keen to show the ways in which we fulfil that brief. Data import and export – sharing our data with the national and international research and library communities. Authority control – giving each author, book series, corporate body, conference, subject, etc. a unique identifier which brings all variations, including variant spellings, synonyms, pen names or aliases together to guide users to the most relevant information and related resources. Reader service support – members of the Department provide a vital role in covering user service points throughout the day but most importantly over lunch periods and in the evenings. 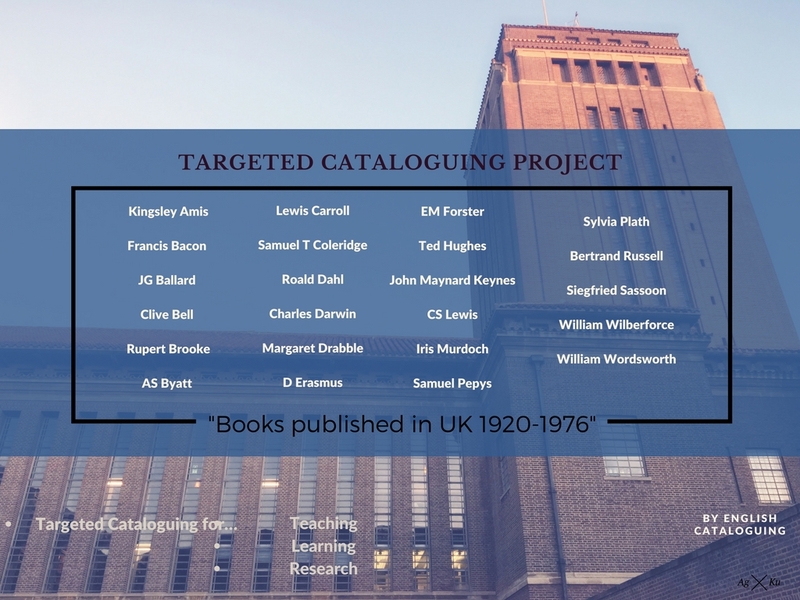 The Targeted Cataloguing Project. 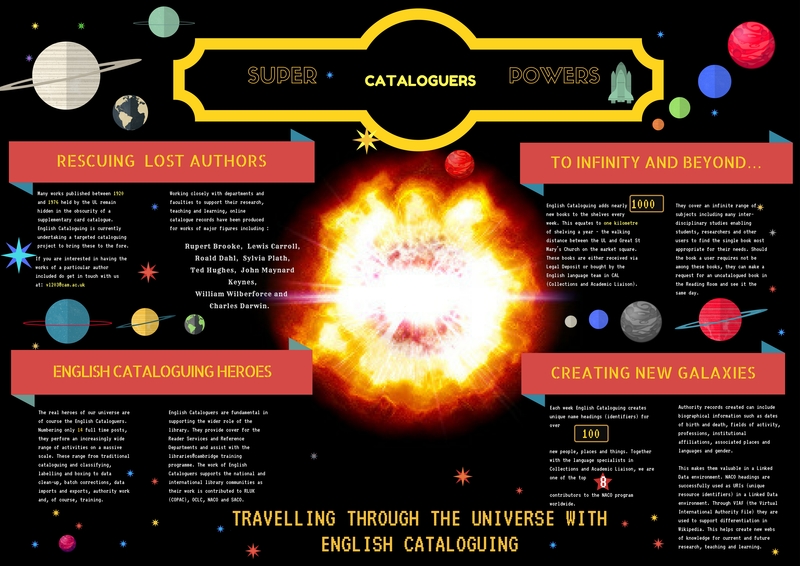 This project aims to bring to the fore works by famous authors published between 1920 and 1976, which have hitherto been hidden in the obscurity of the University Library’s supplementary card. Working together with the colleges, departments and faculties of the University we aim to support teaching and learning by enhancing access to this material through the provision of online records. Of course, the main focus of these activities is not other Cambridge librarians but library users and the research community. The majority of books we receive in the department arrive through Legal Deposit though a significant amount of material, particularly English language works published abroad, is purchased and some material is donated. These various methods of acquisition mean the material we process covers an infinite range of subjects, including many interdisciplinary studies, and our aim is, and always has been, to enable students, researchers and other users to find the single book or range of research material most appropriate to their needs in a timely fashion. Legal Deposit acquisition can, however, result in a delay between publication, receipt and cataloguing. If you are unable to find a book you are looking for do ask our colleagues in the Reading Room. If it is uncatalogued, but in the building, you are likely to be able to see it the same day. If it is not, you may wish to recommend we acquire a resource using the online form on our home page.